Armenian artist Ruben Malayan stands in front of a poster at his booth at the Smithsonian Folklife Festival in Washington, D.C.
"It's like a rhythm, like you're playing the piano," Malayan says as he draws. "Long notes, long lines, short notes, short lines." The students watch him for a beat, then practice scratching out their own lines. Over the past two weeks, he has been teaching workshops and talking about Armenian calligraphy under a little white tent at the festival. Back home in Armenia, Malayan, 47, is a painter, graphic artist and the creator of the iconic protest posters that became a symbol of his country's revolution in April. Using a mix of traditional calligraphy and bold block script, Malayan hand-painted signs that said "defend the revolution" and "be brave" — then gave them away to people in the streets. Protesters used these fierce slogans to pressure Prime Minister Serzh Sargsyan to step down. A few weeks later, he did. A report from Al-Jazeera in May called Malayan's placards the "pop art of the revolution." 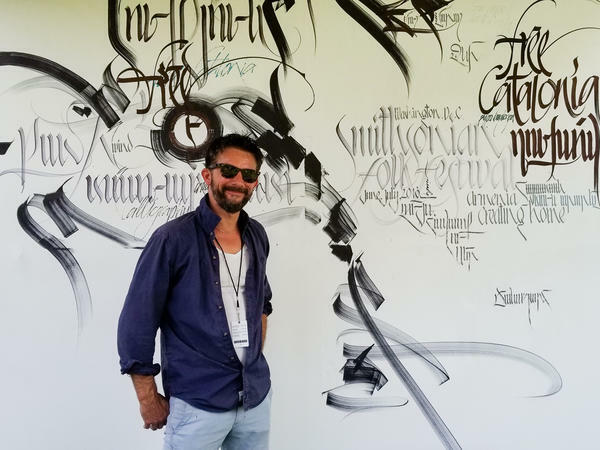 Malayan, also a professor of visual communication at the American University of Armenia, is the author of The Art of Armenian Calligraphy. He is trying to revive the art of calligraphy in his country. What Malayan likes most about calligraphy — and really, any kind of handwriting — is the feeling that it evokes. "When you send an email, there's no emotional record," he says. "When you type something on a screen, it's not personal. You need to send a message, and the form is not important." Writing is just the opposite of that, Malayan explains. "If you receive a letter from someone, written to you, the energy of the writer is passed on." "And when writing goes to the extreme level, it becomes calligraphy," he adds. With the advent of computers and smartphones, Malayan fears that Armenians today are forgetting this ancient art form. He himself didn't know much about Armenian calligraphy until he was invited in 2010 to contribute to the World Encyclopedia of Calligraphy. Over the next few years, he immersed himself in its history — and taught himself the art. More than 30,000 manuscripts displaying Armenian calligraphy can be found in museums and libraries around the world. The styles vary but "80 percent of it is made up of erect vertical lines," says Malayan, who describes the lettering as "compressed, collected, precise." Before Armenia fell under Soviet rule in 1922, calligraphy was a mandatory subject in the country's schools, says Malayan. Armenia is one of the few countries in the world with their own alphabet; the Armenian alphabet was invented in the fifth century by St. Mesrop Mashtots, an Armenian linguist. The curved letters are full of loops and curlicues, reminiscent of Ethiopia's Amharic, says Malayan, although researchers say there is no connection. "We pride ourselves on our alphabet," says Malayan. "It's one of the cornerstones of our culture. We carve it on wood; we embroider it on textiles; we use it in carpet art, in manuscript art." If Malayan had his way, he would reinstate calligraphy class in the school system. By applying calligraphy in a more modern way, like using it in protest posters, he hopes to show Armenians that it still has a place in today's society. The revolution helped propel Malayan's art — and along with it, elements of traditional calligraphy — into the mainstream. His posters, which mix old, new and modern lettering in English and Armenian, were widely shared across social media — and reprinted and photographed. Some signs look like graffiti art. Another looks like a Japanese scroll. Another looks like a page from an ancient Bible. Malayan tried to write messages that "reflected the general mood" of the resistance, he says. "I wanted to say the things that we were all feeling at the time." One popular poster, for example, bears the slogan "Go reject the president and we'll love you for it." That Armenians were able to use nonviolent protests to oust their leader and elect a new one, opposition leader Nikol Pashinyan, is a major milestone, says Malayan. People are calling it the "Velvet Revolution." Now a middle-income country, Armenia has a bloody history, from the Armenian genocide in 1915, which killed nearly 1.5 million people, to its violent secession from the Soviet Union. Malayan hopes to elevate Armenian calligraphy to the status of Chinese and Japanese calligraphy — widely enjoyed and appreciated by people around the world. Over the past few decades, the Armenian government has taken steps to revive the art. In 2008, the country's Ministry of Culture founded Granshan, an international typographic contest for non-Latin typefaces like Cyrillic, Greek and Arabic. Granshan is the Armenian word for script. Malayan has given a talk, made performance art and served as a judge for the competition. And of course, there's his little white tent at the Smithsonian Folklife Festival, where this year, Armenia is one of the featured cultures. This is Malayan's first time in the United States. "I'm really impressed," he says, waving a hand toward the Smithsonian museums and the National Mall, where the festival is hosted. "After this, maybe new ideas will come about. Maybe American students can come to Armenia, and Armenians could come to the U.S. What's important is the cultural exchange." For now, his students at his workshop are still writing the Armenian letter for "A" — the one that looks like a "W" — over and over and over. On a sheet of notebook paper, Malayan writes his favorite word in Armenian. It starts with a swirl and ends with a swirl. The letters feel elegant and bold and urgent. "It's one word I love and it's not accidental," he says. "It says freedom."